where Ω0 is the matter density parameter of the Universe and the projected density ρ is normalised such that its average is unity. where θ is the Heaviside step function. Figure 1: Evolution of the phase-space distribution function of an initial sine wave. 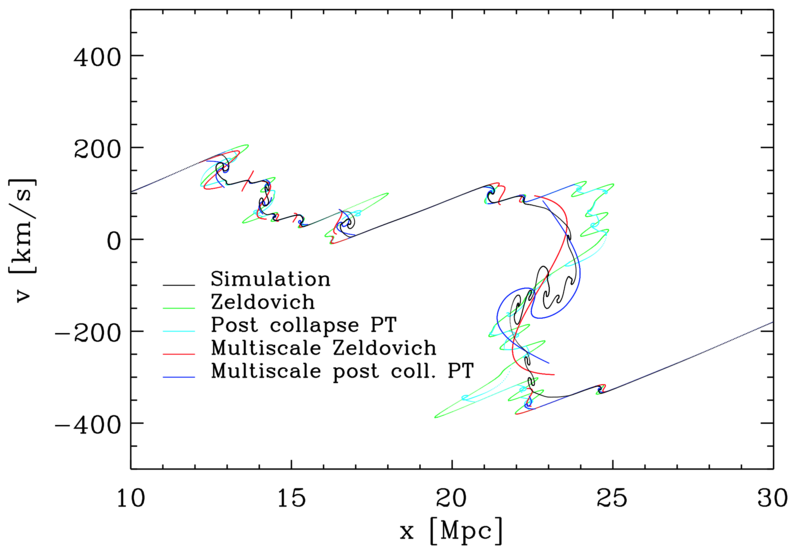 The simulation (red curves) is compared to predictions from post-collapse perturbation theory (blue curves) and Zel'dovich solution (green dots). On each panel, the lower insert shows as well the projected density. From Taruya & Colombi (2017). where P3D is the standard 3-dimensional CDM power-spectrum linearly normalised at present time using the so-called quantity σ8, which represents the r.m.s. of the density fluctuations in a sphere of radius 8 Mpc/h, with h=H0/100. To set P3D, we included in Vlafroid routines written by Eisenstein & Hu (1998). Figure 2: Phase-space distribution function in a CDM like 1D Universe. The simulation (in black) is compared to predictions from post-collapse perturbation theory and Zel'dovich solution as indicated on the panel. In addition to numerically solving the actual equations of the dynamics, the code also computes the predictions given by the Zel'dovich approximation. Optionally, it can also compute predictions by various variants of post-collapse perturbation theory, with and without adaptive smoothing of initial conditions, as described in Taruya & Colombi (2017). Outputs of the code consist of positions and velocities of particles, power-spectrum of the projected density, 2-point correlation function, and this for the simulation, the Zel'dovich solution and other perturbative models if required, as well as various quantities estimated on the computational mesh, such as the gravitational potential, the acceleration, the projected density and velocity moments of the phase-space distribution function.